Diarmait mac Máel na mBó (died 7 February 1072) was King of Leinster, as well as High King of Ireland (with opposition). 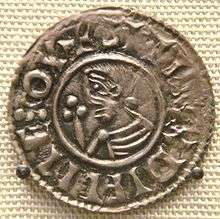 He was one of the most important and significant kings in Ireland in the pre-Norman era. His influence extended beyond the island of Ireland into the Hebrides, the Isle of Man, Wales, and even into England. There will not be peace, there will not be armistice. ↑ Hudson, "Diarmait"; Byrne, Irish Kings, pp. 271–272 & 290. ↑ DOC, EMI; Hudson, VP; and? ↑ N.B. : DOC, EMI, p. 54.